If there's any celebrity whose style I truly admire, it would be Emma Stone. I also happen to love her hair as well and think she'd probably be really fun to hang out with. Her red carpet style is pretty much flawless (and modest in a good way!) but even when casually dressed, she always manages to look perfectly chic and well put together. This fall outfit she was spotted wearing in NYC wearing recently is a prime example. She is dressed practically for the cool weather and comfortably to walk around but the outfit also has plenty of personality. 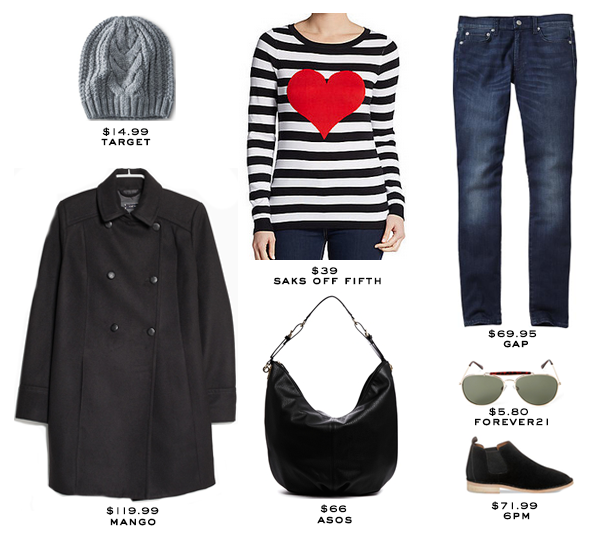 Fortunately for the rest of us, this effortlessly fashionable look is fairly easy to recreate starting with this graphic striped heart sweater, add a pair of skinny jeans, top with a classic double-breasted wool coat and finish with a cabled beanie, some cool sunglasses, flat suede booties and a slouchy hobo bag. Would you wear this outfit? What do you think of Emma Stone's style? I just wanted to say a big thank you to everyone for your incredibly sweet and wonderful comments on my blog anniversary post earlier this week. I'm beyond touched and overwhelmed by your kindness and feel so lucky to have the best blogger friends. Love all the items :) Keep In touch dear..
She looks super cute; I love all your selections for recreating this outfit. That's a super cute look! I love it from head to toe. I love Emma Stone, esp after her lip sync battle with Jimmy Fallon! Have you seen that one? :D Anyhoo, she always looks effortlessly chic, street-style wise or in the red carpet. Great pick love the top . Have a lovely weekend doll. love her style! and her! Yeah, she has great style :-) Nice collage. I love the jumper, she has a great style sense! fabulous jumper with stripes...and that big heart...I might copy that! Emma Stone looks great I love how casual her look is. I love her effortless stylish-ness! Oh Emma has such wonderful style and this one is lovely! Have a wonderful weekend! I love her style too. This is such a cute outfit. Have a lovely weekend! So casual, so stylish.... <3!!! Oh I love your looks for less! The striped shirt and the shoes are pretty much exact. Love! Jasmine, I'm back again! Come & join my giveaway to Win Vitacost USD 75 X'mas Shopping Coupons At Luxury Haven!! Hurry, giveaway ends in 1 day! I love her style! So effortlessly cute! Love her chic and cool style!! I agree that she has a great style! I like her. She is gorgeous and her style is always chic. I also love how low profile she is, Miley Cyrus should take advise from her. I love her look !!! I think she's a cool person. At least I've not heard negative stories about her. this girl def. has a great casual sense of style. I love Emma's brand of off-duty, relaxed style! Great post and I LOVE Emma's style and the striped sweater you picked! MAN! I have been on the HUNT for the perfect aviators!!!! These look very cool. Yeah dear, I have seen some of the emma stone pictures and she is looking an absolute fashionista in those pictures. Anyway thanks for a great share, especially for those shopping details. How pretty is this Street Style! I loved this style. Well guys I have seen a lot of hot pictures of Emma on a site. This website has a new collection of emma stone naked photos. The entire collection is so good and fresh. I am sure you will love all of those photos. superb!outfit your are looking cute,. safety engineering course in chennai|safety courses in chennai|hse courses in chennai|fire and safety courses in chennai|offshore training courses in chennai|industrial safety courses in chennai.